Prospective lawyers, Eino Nangolo and Caitlin Quinn’s academic achievements in 2016 were officially recognised by the Judge JP Karuaihe Trust last week when they received the awards for Best LLB final year student and Best Justice Training Centre student respectively. 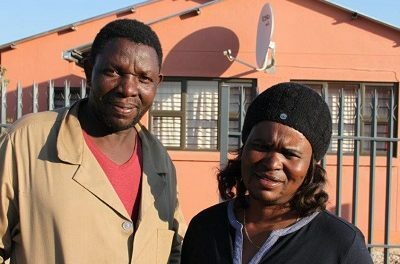 Nangolo achieved an average score of 76,5% across his subjects and Quinn an average of 65% for her eleven JTC subjects. The two students each received a trophy and a cash prize. A JPK trustee, Paa Ntinda presented the trophies while the incoming chairperson of the Law Society of Namibia, Meyer van den Berg gave the cash prizes. The awards formed part of the Legal Excellence Awards bestowed every year by the Judge JP Karuaihe Trust for academic achievement. For the past five years, the awards have been made in collaboration with the Law Society, and the award ceremony takes place just before the Law Society’s Annual General Meeting. Further Legal Excellence awards are conferred on law firms for their contribution to Social Responsibility, and to the promotion and protection of Human Rights. The Legal Excellence Award for Social Responsibility went to the Oshakati-based firm, Greyling & Associates. The award for Human Rights went to the Legal Assistance Centre. Willem Greyling accepted the award on behalf of his firm and Toni Hancox, the Director of the Legal Assistance Centre accepted the award on behalf of her institution. Both awards were also presented by Paa Ntinda. The Law Society said its involvement with the Judge JPK Trust started in 2006 when the Society first assisted the trustees of the JPK Trust to select deserving winners for the Legal Excellence Awards. The overarching aim is to promote the Rule of Law. The Law Society’s Access to Law and Social Responsibility Committee is responsible for adjudication. This year’s awards mark the 18th anniversary of the Judge JP Karuaihe Trust. Pictured at the Legal Excellence Awards of the Judge JP Karuaihe Trust, from the left, Umbi Karuaihe-Upi, a trustee, Philip Balhao who received the Best LLB Student trophy on behalf of Eino Nangolo, Ngamane Karuaihe-Upi, a trustee, Willem Greyling of Greyling & Associates, Paa Ntinda, a trustee, Toni Hancox, Director of the Legal Assistance Centre, Meyer van den Berg, incoming chairperson of the Law Society, Vicky ya Toivo, a trustee, Ramon Maasdorp, outgoing chairperson of the Law Society, and Caitlin Quinn, best JTC student.